Phil goes on a jog every Monday. 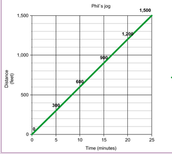 Phil goes at a constant rate for 25 minutes then he stops. Phil is going on a jog. He is going at a constant rate of 300 ft per 5 minutes. He stops at 25 minutes or 1,500 ft. The graph is gradually increasing because as more of his time walking increases so does the distance he walked from the starting point. My independent variable is time. A independent variable is a variable that doesn't depend on any thing. My dependent variable is the distance. A dependent variable is a variable that depends on the independent variable. My constant is 300 ft per 5 minutes. A constant is a variable that never changes.